Nectarine Blossom & Honey by Jo Malone – created in 2005, notes include nectarine, peach, plum, blackcurrant, vetiver and acacia honey. This perfumes plays tricks on me: there is at least three people on whom I like this perfume very much – I smell, recognize and enjoy it whenever one of them wears it, alone or in combination with other scents (it layers nicely with Vanilla & Anise or with Grapefruit). It smells so good on my co-worker, but on me… I tried it on multiple occasions hoping it would smell different. But time after time it’s too fruity, too sweet, too… I can’t stand it. And still, on others it smells great. So I encourage everybody to try it on your skin before making a final decision. Lime Basil & Mandarin by Jo Malone – created in 1999, notes include lime, mandarin orange, bergamot, basil, caraway, lilac, iris, patchouli and vetiver. This is one of my least favorite colognes in the line. I do not think of it as of poorly done or unbalanced perfume. It’s very clean, citrus-y and inoffensive. But it’s too… masculine(?) for my taste. Not in the meaning of being strong, manly or assertive but rather of non-feminine, simple and perfume-shy character. A woman could easily wear it I just don’t see why she would want to do so. 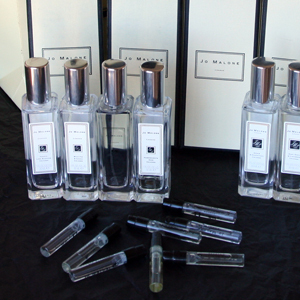 It’s said to be a good layering element so if you happen to get it somehow give it a try (Jo Malone’s site suggests, for example, to combine it with the cologne I’ll describe next) but I’m done with it and the remaining portion of a sample will probably just die in my collection. Pomegranate Noir by Jo Malone – created in 2005, notes include raspberry, plum, pink pepper, pomegranate, patchouli, frankincense and spicy woods. This was my first full bottle I bought from the brand. I like both the idea of a pomegranate in a perfume and this cologne’s scent. Unfortunately, these two aren’t connected in this creation. During the season usually I eat a half of a pomegranate a day so I think I’m very familiar with this fruit’s smell. I do not find it in the perfume at all. For me it smells like a combination of dried fruit and patchouli with woody undertones. I like it but I do not think it lives up to the name, to any of its two parts – neither it has a proper fruit, nor it’s really dark. It’s not as light and airy as many others Malone’s scents, but it’s still very sheer. It wears nicely in a colder weather. I have less than one fifth of the perfume left in my bottle. Will I go for the next one once it’s gone? I do not know. Read real reviews at NST for Nectarine Blossom & Honey and Pomegranate Noir, at Perfume Smellin’ Things for Nectarine Blossom & Honey. This entry was posted in Bête Noire, Favorite Perfumes, Not a Review, Weeklong Test Drive and tagged Grapefruit, Jo Malone, Lime Basil & Mandarin, Nectarine Blossom & Honey, Pomegranate Noir, Vanilla & Anise. Bookmark the permalink. But for some reason, when I sprayed it on later, it didn’t work. I have to re-visit and see if it’s going to be better now. I think they both aren’t summer scents. Not only temperature-wise (it might be relatively cold during summer as well) but in spirit. Since they both are easily available from stores that carry them it doesn’t carry any risks :) I wouldn’t advise anybody to buy samples (well, maybe some from limited editions) but I urge friends to give it a try if free testers are accessible. I have samples of both Pom Noir and LBM so I’m going to try the layering suggestion. LBM smells fantastic on my husband and Pom Noir great on a friend. Neither smell all the great on me. Try them together – what do you have to loose? Who knows, it might be interesting. Pomegranate Noir is the best of JM IMO. Not much of pomegranate, I agree, but to me pomegranate….. doesn’t smell. Anosmic to it? lol. This fragrance stands out in this line with 154 because I think it is more masculine and it is very strong. On me it lasts for at least 6 hours and projects great. The opening is pure perfection, balance, sweet and sour, camphorous, aromatic. This is the one of two fragrances that I have needed a refill (the other one being Encre Noire). And yes Undina, you are right! It wears beautifully in cold weather. I think pomegranate seeds are more about look and taste than about smell. Skin also doesn’t smell much. If any, the smell should come from the white spongy pulp in which seeds are embedded. Once new crop of pomegranates is available I’ll smell it again, but from the memory – it’s mostly bitter and, yes, camphorous scent, nothing to suggest the taste that is coming once you start eating seeds. Have you tried Wild Fig & Cassis? For some reason these two come to mind together. It’s not the similar scent, but it smells … similar on some conceptual level. Well you must be right because I like WF&C and I own a 30ml bottle. I can’t make my mind up whether this or Philosykos is my favourite fig scent…. The Jo Malone rendition of fig is more sparkling and uplifting while the Diptyque version is a more “round” composition I think. I own a bottle of WF&C as well – and because of that I wasn’t impressed by Philosykos as much as I expected from all the reviews I read before trying it. I will be trying it again but they are not too far apart and I like WF&C slightly more. Have you also tried Annick Goutale Nimfeo Mio? A very interesting scent around fig, but a lot more complicated. A lot more going on than just fig and quite a big departure from the usual citrus fresh style of the house.